The supposedly protective confines of a zoo enclosure were not enough to save two animals from the idiocy of people out to kill for fun. Earlier this month, a group of gun-toting hunters succeeded in their grim goal of shooting animals in Narvik, Norway, but their targets were far from taken fairly. Moments after opening fire on a group of moose from a distance, killing two in a hail of bullets, the hunters discovered the moose were actually behind a fence. As it turns out, they weren't wild after all - they were being held captive in an outdoor exhibit at the Polar Park Zoo. Afterward, the hunters informed the zoo of the apparent accident, claiming their hunting dogs had led them to the animals during what was a legal hunt. 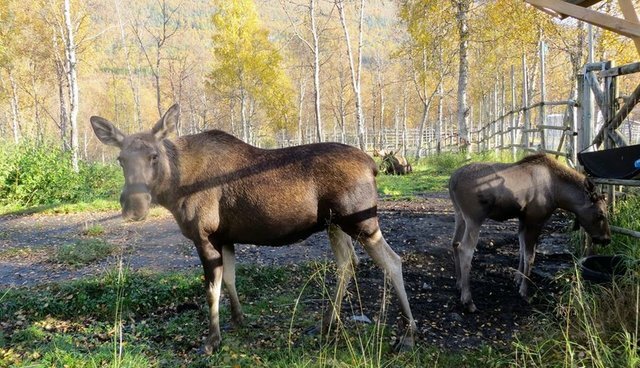 The facility's director, Heinz Strathmann, told Norwegian news outlet NRK that the situation was "very sad," leaving just three moose remaining on display. Although police are investigating just what happened, a chairman from the local wildlife tribunal believes that the hunters should not be prosecuted, telling the news outlet: "It was a fatal error, but everyone understands that it was not done at all on purpose." The incident highlights the dangerous tendency among hunters to shoot first and ask questions later - and animals aren't the only innocent victims. According to the International Hunter Education Association, hunters in the United States and Canada accidentally shoot around 1,000 people every year, resulting in nearly 100 fatalities. Note: Some outlets have reported the animals, referred to in local media as"elg", were elk, not moose. According to the Norwegian American Weekly, "Norwegian Elg are called Moose in North America and European Elk in Europe BUT when Europeans talk about them in English they call them Moose."